have flown into the "Samphire Coast" to summer-over . wait for it .... brine shrimps !! Wow .. what a gorgeous shot Dianne. National Geographic material. Thanks for your comment on my panning shot. .. I didn't use the ND filter. I just gradually slow down the shutter speed until I get the right exposure. Trams are pretty easy. They come along often on a predictable path and speed. Totally unlike anything I've ever seen! Wow what a great photo. Congratulations. Great photo of beautiful birds. Those are birds I have only read about and would love to see. Thanks for your comment re trimming the callistemons. I tried to do that when the plants were much younger - but - they got totally our of hand! The Stilts are beautiful birds, great shots. Wel built for wading and fishing. the colour problem makes the shot interesting. 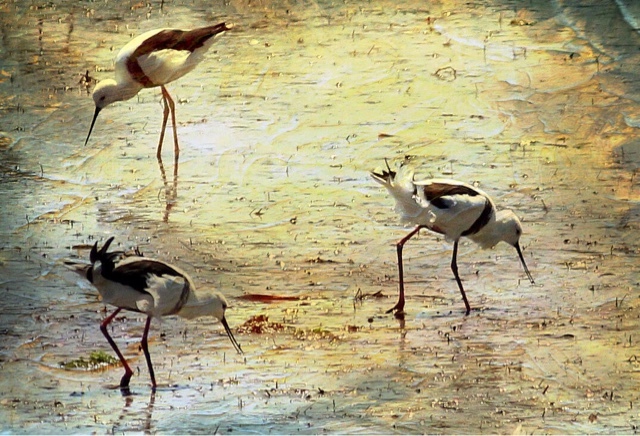 Lovely shots of these shorebirds! Gosh Dianne your last three images have been a wonderful mix of pastel blues, pinks and gold, too beautiful.